History. It seems you either love it or hate it. I’ve felt both an indifference and love for history in my life. As a young student, reading history from a textbook, I was often bored. As an adult, I learned to appreciate history as I traveled and heard about the people and places that were referenced in those dry books. 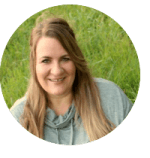 As a former homeschooling mom, I tried to bring history to life for my kids. 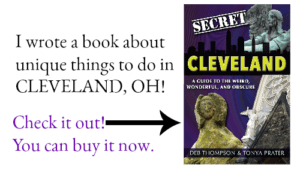 That included traveling to living history museums, listening to speakers and costumed interpreters at local museums, and even reading the historical markers that are located in my hometown and in many of the states that we travel to. The markers were often a great introduction to a historical topic. 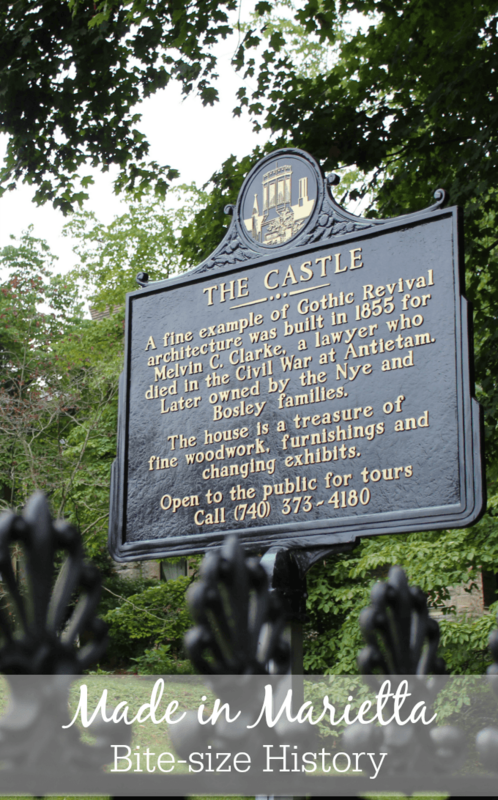 After reading the bite-size pieces of information on the historical plaques, my kids were able to decide if that was a subject they wanted to delve deeper into. I was thrilled to learn that the makers of the historical markers I’m so fond of are located in Marietta, Ohio. I had the opportunity to sit down and talk to Bradford Smith, the President of Sewah Studios during my time there and received a tour of the facility. I left fascinated by the work they do, entirely by hand. Prior to the depression, prisoners made historical markers out of iron. With the new interstate system, E.M. Hawes, the original owner of Sewah Studios, saw a need to have more signs made and in 1927 he formed his own company. He named his business ‘Sewah’, which is actually Hawes spelled backwards and added the word Studios. 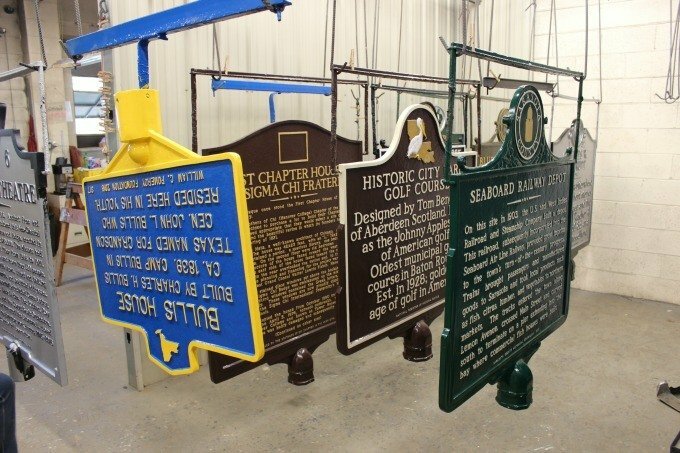 Since that time, Sewah Studios has been making historical markers for historic sites across the US and some foreign countries as well. Mr. Hawes sold the company in 1954 and the company has now been operated by the same family for three generations. 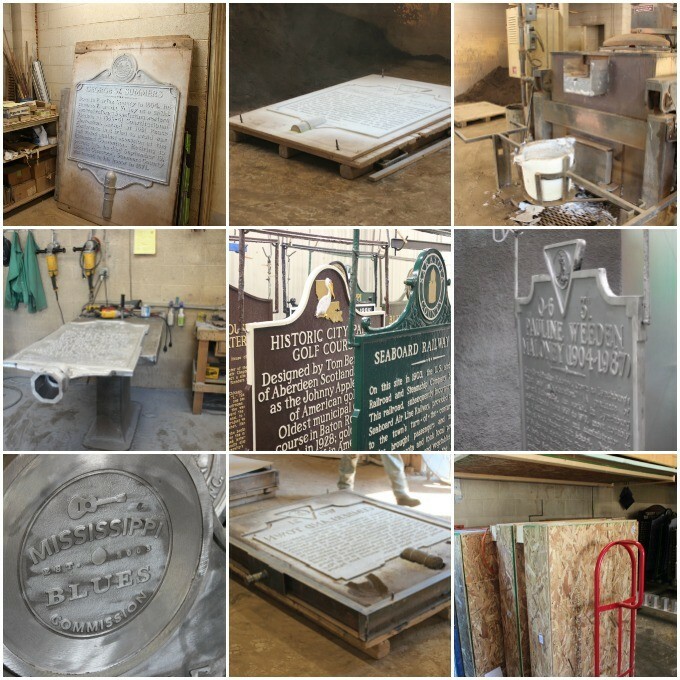 The current owner, Bradford Smith, has been running the company since 2003 and the company is as busy as ever; employing 20 people and producing 1,200 historical markers a year, which equates to about six markers each work day. 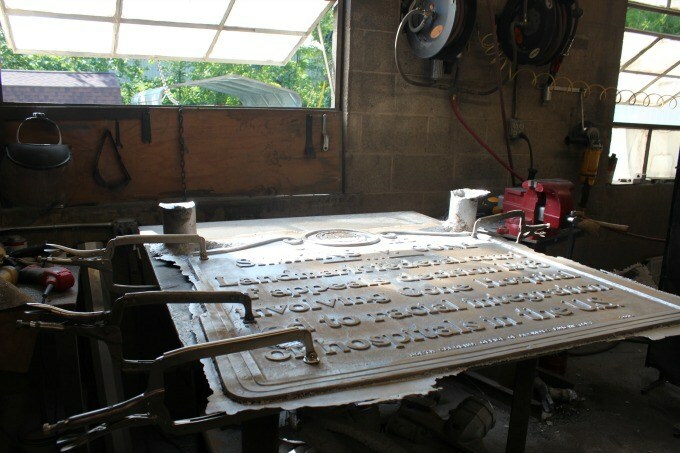 Bradford walked me through the factory so I could see firsthand the steps that go into making the cast aluminum markers. You won’t find computers outside of the office, this product is made entirely by hand. Starting in typeset where a template is formed using metal letters that are over 50 years old, to the foundry where the molten metal is poured, to finishing, painting, and finally shipping the product in custom shipping crates that are also made on-site. It’s hot, dusty work, but the finished product is beautiful and something Bradford, and the employees, are proud to package and send out to be displayed for generations to come. 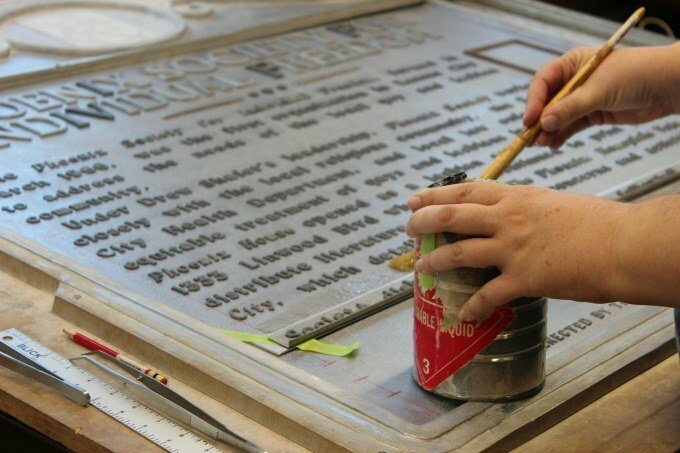 If you’d like to learn more about the process of making historical markers, visit www.sewahstudios.com. If you’d like to seek out some markers in your area or when traveling, visit www.hmdb.org or play Pokemon Go, as it seems many historical markers are also Poke stops. 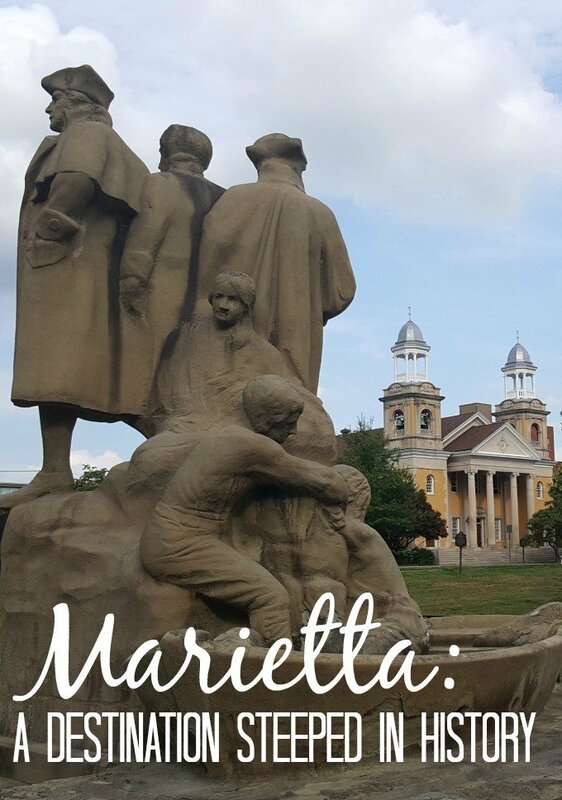 If you’d like to learn more about Marietta, check out this post: Marietta, Ohio: a River Town Steeped in History. If you click on the photo below, it will take you to that page. I am loving this! Older signs have always been fascinating to me. This is really neat. I love those signs when they are placed in front of a historical place. That was an interesting read. That’s awesome the company has been run by the same family for three generations! I love history if I’m traveling too! It’s a hands on way to really get involved in learning about what went on whereever it is you may be. There are many of these markers in Philadelphia. I never thought about their origin. Thanks for filling in that gap! Wow, that looks like a great place to visit. We are history buffs over here, I would love to work there. Thank you for sharing. How interesting! I love to see traditional products totally thriving like this. This is super neat! I’ve never heard of this place before and would love to take the kids for a bit of history! What a great place and it has a great history! I’m sure that you had fun there. I love visiting places like this. I fall into the “love it” group when you’re talking about history. Like you’re doing with your kids, my parents always made an effort to bring it to life. Sounds like Sewah Studios is a fun destination to explore what was. This is so interesting! We love visiting places with historical background. I always find those historical markers to be fascinating. Even more so now that I know they are made by hand! What a unique post. I am definitely one of those people who have never really thought about where /how historical markers were made. This is a place that I would really love to visit. It looks so interesting! Those signs are absolutely stunning. These signs are beautiful and it looks like you had a great time. Their signs seem like they’re very high quality. It’s pretty amazing that they make so many each year! I am a total history buff and always enjoy learning about a new place. I have seen those historical markers in many cities and never thought to question how they were made. How cool! Very interesting, had no idea about Marietta but have been learning quite a bit! Sounds like a great place. That looks like so much fun! This is definitely somewhere I would love to go with my family! You know, I had never wondered about historical markers before. It’s cool to find out how they’re made. My mom would LOVE to go on a trip like this! She is all about history! There is nothing I love more than adding a historical perspective an education to our family’s vacation! Even when you think they are not listening they are soaking it all in! Sounds like a great trip! How fun! I love visiting places that combine history with a good time. I think our family would have a great time there.